The gravity of Earth, denoted by g, is the net acceleration that is imparted to objects due to the combined effect of gravitation (from distribution of mass within Earth) and the centrifugal force (from the Earth's rotation). In SI units this acceleration is measured in metres per second squared (in symbols, m/s2 or m·s−2) or equivalently in newtons per kilogram (N/kg or N·kg−1). Near Earth's surface, gravitational acceleration is approximately 9.8 m/s2, which means that, ignoring the effects of air resistance, the speed of an object falling freely will increase by about 9.8 metres per second every second. This quantity is sometimes referred to informally as little g (in contrast, the gravitational constant G is referred to as big G). The precise strength of Earth's gravity varies depending on location. The nominal "average" value at Earth's surface, known as standard gravity is, by definition, 9.80665 m/s2. This quantity is denoted variously as gn, ge (though this sometimes means the normal equatorial value on Earth, 9.78033 m/s2), g0, gee, or simply g (which is also used for the variable local value). The weight of an object on Earth's surface is the downwards force on that object, given by Newton's second law of motion, or F = ma (force = mass × acceleration). Gravitational acceleration contributes to the total gravity acceleration, but other factors, such as the rotation of Earth, also contribute, and, therefore, affect the weight of the object. Gravity does not normally include the gravitational pull of the Moon and Sun, which are accounted for in terms of tidal effects. It is a vector (physics) quantity, whose direction coincides with a plumb bob. A non-rotating perfect sphere of uniform mass density, or whose density varies solely with distance from the centre (spherical symmetry), would produce a gravitational field of uniform magnitude at all points on its surface. The Earth is rotating and is also not spherically symmetric; rather, it is slightly flatter at the poles while bulging at the Equator: an oblate spheroid. There are consequently slight deviations in the magnitude of gravity across its surface. Gravity on the Earth's surface varies by around 0.7%, from 9.7639 m/s2 on the Nevado Huascarán mountain in Peru to 9.8337 m/s2 at the surface of the Arctic Ocean. In large cities, it ranges from 9.7760 in Kuala Lumpur, Mexico City, and Singapore to 9.825 in Oslo and Helsinki. In 1901 the third General Conference on Weights and Measures defined a standard gravitational acceleration for the surface of the Earth: gn = 9.80665 m/s2. It was based on measurements done at the Pavillon de Breteuil near Paris in 1888, with a theoretical correction applied in order to convert to a latitude of 45° at sea level. This definition is thus not a value of any particular place or carefully worked out average, but an agreement for a value to use if a better actual local value is not known or not important. It is also used to define the units kilogram force and pound force. 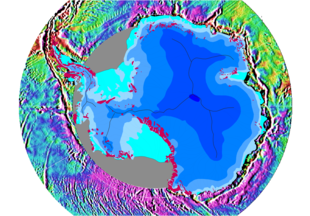 The differences of Earth's gravity around the Antarctic continent. The surface of the Earth is rotating, so it is not an inertial frame of reference. At latitudes nearer the Equator, the outward centrifugal force produced by Earth's rotation is larger than at polar latitudes. This counteracts the Earth's gravity to a small degree – up to a maximum of 0.3% at the Equator – and reduces the apparent downward acceleration of falling objects. The second major reason for the difference in gravity at different latitudes is that the Earth's equatorial bulge (itself also caused by centrifugal force from rotation) causes objects at the Equator to be farther from the planet's centre than objects at the poles. Because the force due to gravitational attraction between two bodies (the Earth and the object being weighed) varies inversely with the square of the distance between them, an object at the Equator experiences a weaker gravitational pull than an object at the poles. In combination, the equatorial bulge and the effects of the surface centrifugal force due to rotation mean that sea-level gravity increases from about 9.780 m/s2 at the Equator to about 9.832 m/s2 at the poles, so an object will weigh approximately 0.5% more at the poles than at the Equator. It is a common misconception that astronauts in orbit are weightless because they have flown high enough to escape the Earth's gravity. In fact, at an altitude of 400 kilometres (250 mi), equivalent to a typical orbit of the ISS, gravity is still nearly 90% as strong as at the Earth's surface. Weightlessness actually occurs because orbiting objects are in free-fall. The effect of ground elevation depends on the density of the ground (see Slab correction section). A person flying at 30 000 ft above sea level over mountains will feel more gravity than someone at the same elevation but over the sea. However, a person standing on the Earth's surface feels less gravity when the elevation is higher. gh is the gravitational acceleration at height h above sea level. Re is the Earth's mean radius. g0 is the standard gravitational acceleration. The formula treats the Earth as a perfect sphere with a radially symmetric distribution of mass; a more accurate mathematical treatment is discussed below. The actual depth dependence of density and gravity, inferred from seismic travel times (see Adams–Williamson equation), is shown in the graphs below. Earth's gravity according to the Preliminary Reference Earth Model (PREM). Two models for a spherically symmetric Earth are included for comparison. The dark green straight line is for a constant density equal to the Earth's average density. The light green curved line is for a density that decreases linearly from center to surface. The density at the center is the same as in the PREM, but the surface density is chosen so that the mass of the sphere equals the mass of the real Earth. Local differences in topography (such as the presence of mountains), geology (such as the density of rocks in the vicinity), and deeper tectonic structure cause local and regional differences in the Earth's gravitational field, known as gravitational anomalies. Some of these anomalies can be very extensive, resulting in bulges in sea level, and throwing pendulum clocks out of synchronisation. The study of these anomalies forms the basis of gravitational geophysics. The fluctuations are measured with highly sensitive gravimeters, the effect of topography and other known factors is subtracted, and from the resulting data conclusions are drawn. Such techniques are now used by prospectors to find oil and mineral deposits. Denser rocks (often containing mineral ores) cause higher than normal local gravitational fields on the Earth's surface. Less dense sedimentary rocks cause the opposite. In air or water, objects experience a supporting buoyancy force which reduces the apparent strength of gravity (as measured by an object's weight). The magnitude of the effect depends on the air density (and hence air pressure) or the water density respectively; see Apparent weight for details. The gravitational effects of the Moon and the Sun (also the cause of the tides) have a very small effect on the apparent strength of Earth's gravity, depending on their relative positions; typical variations are 2 µm/s2 (0.2 mGal) over the course of a day. Gravity acceleration is a vector quantity. In a spherically symmetric Earth, gravity would point directly towards the sphere's centre. As the Earth is slightly flatter, there are consequently slight deviations in the direction of gravity. Tools exist for calculating the strength of gravity at various cities around the world. The effect of latitude can be clearly seen with gravity in high-latitude cities: Anchorage (9.826 m/s2), Helsinki (9.825 m/s2), being about 0.5% greater than that in cities near the equator: Kuala Lumpur (9.776 m/s2), Manila (9.780 m/s2). The effect of altitude can be seen in Mexico City (9.776 m/s2; altitude 2,240 metres (7,350 ft)), and by comparing Denver (9.798 m/s2; 1,616 metres (5,302 ft)) with Washington, D.C. (9.801 m/s2; 30 metres (98 ft)), both of which are near 39° N. Measured values can be obtained from Physical and Mathematical Tables by T.M. Yarwood and F. Castle, Macmillan, revised edition 1970. This is the International Gravity Formula 1967, the 1967 Geodetic Reference System Formula, Helmert's equation or Clairaut's formula. The difference between the WGS-84 formula and Helmert's equation is less than 0.68 μm·s−2. and altitude h in metres. Note: The section uses the galileo (symbol: "Gal"), which is a cgs unit for acceleration of 1 centimetre/second2. For the gravity below the surface we have to apply the free-air correction as well as a double Bouguer correction. With the infinite slab model this is because moving the point of observation below the slab changes the gravity due to it to its opposite. Alternatively, we can consider a spherically symmetrical Earth and subtract from the mass of the Earth that of the shell outside the point of observation, because that does not cause gravity inside. This gives the same result. where r is the distance between the centre of the Earth and the body (see below), and here we take m1 to be the mass of the Earth and m2 to be the mass of the body. Note that this formula only works because of the mathematical fact that the gravity of a uniform spherical body, as measured on or above its surface, is the same as if all its mass were concentrated at a point at its centre. This is what allows us to use the Earth's radius for r.
This calculated value of g only includes true gravity. It does not include the reduction of constraint force that we perceive as a reduction of gravity due to the rotation of Earth, and some of gravity being counteracted by centrifugal force. There are significant uncertainties in the values of r and m1 as used in this calculation, and the value of G is also rather difficult to measure precisely. If G, g and r are known then a reverse calculation will give an estimate of the mass of the Earth. This method was used by Henry Cavendish. ^ NASA/JPL/University of Texas Center for Space Research. "PIA12146: GRACE Global Gravity Animation". Photojournal. NASA Jet Propulsion Laboratory. Retrieved 30 December 2013. ^ a b Boynton, Richard (2001). "Precise Measurement of Mass" (PDF). Sawe Paper No. 3147. Arlington, Texas: S.A.W.E., Inc. Retrieved 2007-01-21. ^ Hirt, Christian; Claessens, Sten; Fecher, Thomas; Kuhn, Michael; Pail, Roland; Rexer, Moritz (August 28, 2013). "New ultrahigh-resolution picture of Earth's gravity field". Geophysical Research Letters. 40 (16): 4279–4283. Bibcode:2013GeoRL..40.4279H. doi:10.1002/grl.50838. hdl:20.500.11937/46786. ^ "The G's in the Machine", NASA, see "Editor's note #2"
^ Tipler, Paul A. (1999). Physics for scientists and engineers (4th ed.). New York: W.H. Freeman/Worth Publishers. pp. 336–337. ISBN 9781572594913. ^ a b A. M. Dziewonski, D. L. Anderson (1981). "Preliminary reference Earth model" (PDF). Physics of the Earth and Planetary Interiors. 25 (4): 297–356. Bibcode:1981PEPI...25..297D. doi:10.1016/0031-9201(81)90046-7. ISSN 0031-9201. ^ Watts, A. B.; Daly, S. F. (May 1981). "Long wavelength gravity and topography anomalies" (PDF). Annual Review of Earth and Planetary Sciences. 9: 415–418. Bibcode:1981AREPS...9..415W. doi:10.1146/annurev.ea.09.050181.002215. ^ T.M. Yarwood and F. Castle, Physical and Mathematical Tables, revised edition, Macmillan and Co LTD, London and Basingstoke, Printed in Great Britain by The University Press, Glasgow, 1970, pp 22 & 23. ^ The rate of decrease is calculated by differentiating g(r) with respect to r and evaluating at r=rEarth.